Grande Centre Point Sukhumvit Terminal 21 is a huge five star hotel with some of the most luxurious rooms and facilities on Sukhumvit Road. 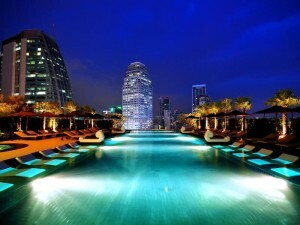 Rooms are large, with huge soft beds, working spaces, free Wi-Fi and excellent views of Bangkok. The hotel has a giant outdoor pool that has great views of the skyscrapers around Asoke BTS station. Located on top of Terminal 21 shopping mall, Grande Centre Point Sukhumvit is less than two minutes walk from a huge range of cafes, restaurants and fast food outlets. 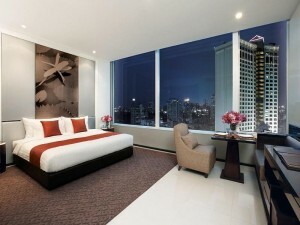 It’s also directly connected to Asoke BTS station and Sukhumvit MRT station, making it one of the most conveniently located luxury hotels in the city.